How to do USB Data Recovery? There are many types of issues that can turn your USB drive not working. This may happen due to logical corruption or physical corruption. Today we will check the process of USB data recovery in different data loss situations. Dealing with Corrupt or Inaccessible USB drive? Firstly, you must be able to identify the type of problem that you are getting while reading the USB drive; this will help you to properly recover data from an inaccessible USB drive. If your USB drive has logical or software errors, you can easily fix them. In such case, you need to repair the file structure of your USB drive so that it can be used again. Insert your USB drive into the USB port of the system. Then, click on ‘My Computer’ and go to Removable Disk Icon. Open the Properties by right clicking on the Removable Disk Icon. Click on the button ‘Check Now’. You need to check both the check boxes. Start the scanning process by clicking on ‘Start’. After the scanning process is completed, click ‘Close’. Insert your USB drive into the USB port of your computer. Go to ‘My Computer’ and click on ‘Removable Disk Icon’. Right click on the ‘Removable Disk Icon’, and then open its Properties. And click on ‘Rebuild’ button. Let the scan process to complete. Once it’s completed, close the scan window. Right click on the icon of the USB flash drive and click on the ‘Eject’ option. After that, remove your drive from the USB port of your computer. Hope the above steps would help to solve your problem. How to Recover your USB Drive from Physical Issue? 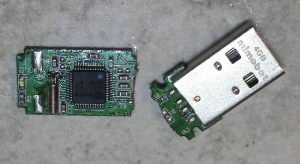 If your USB drive has some physical errors such as broken circuit board, connector, or NAND memory chip of your drive, then the hardware of your USB drive needs to be repaired or replaced. Using DIY methods can worsen the situation. So it’s better that you get help from the experts in this field. You can hire a professional data recovery company that specializes in recovering USB drives from physical issues. Test the USB port of your system: Your USB drive might not be working because of some problems in the USB port and not with your USB drive. So, before you perform any type of repair of the USB drive, make sure that the USB port of your system is working properly. How to test the USB port? First, you remove the USB drive, reboot the computer and again test your USB drive. See if it works. It may be possible that one port might not be working while all others are working well. So try on your computer’s each port. If still, it doesn’t work, try your USB drive on some other computer. Expand the list which is right next to the ‘Disk Drives’ option. Now you will be able to see an arrow down facing over your USB drive. You need to double click it and select the option to ‘Enable Device’. Click Next, then again click on ‘Next’. Click on ‘Start’, go to ‘Control Panel’, then go to ‘System and Security’, then ‘Administrative Tools’ and select ‘Computer Management’. Right click on the USB drive and select the option ‘Change Drive Letter and Paths’. Click on ADD and then click OK. Assign any of the available driver letter to your USB drive by clicking on it. Right click on the USB to assign it as ‘Online’. If it doesn’t work, then use the ‘Fix it For Me’ service of Windows which is automated. If still, it doesn’t work, then you can handle the situation by modifying the system registry. But this option is not recommended as it may prove to be harmful to your OS. If none of the above remedies proves to be helpful for you, then you need to contact a professional USB data recovery service to recover your data. Datadoctor is one of the few companies in the UK that can recover data from a physically damaged USB drive. Regardless if it is physical damage, logical failure, corrupted, virus infected, formatted, deleted or fire damaged, we are able to help you. We have the tools and experts to get your data off your USB drive and back in your hands safely and quickly. Start your case by calling us today.